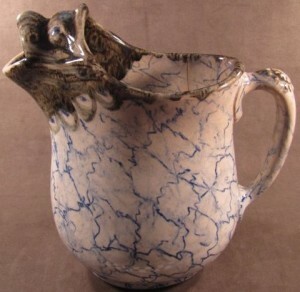 In the late 1800s, two Maddocks, father Thomas and son John, founded several ceramic companies in the city of Trenton. The exhibit explores the breadth and the importance of their operations to the pottery industry in Trenton. Thomas Maddock, born in 1818 into a Burslem, Staffordshire, England family of potters, arrived with his wife Honor Bossom in New York in 1847. They had two sons, one who died in childhood, and the other, John, who eventually founded his own pottery company in Trenton. Having served his apprenticeship as a decorator in England, Thomas and his partner William Leigh set up a china decorating company in New York City, the first of its kind in the United States. Honor Maddock died in 1851 and Thomas quickly remarried to Isabella Smith in 1852. Over the next nine years, their union produced three sons: Charles S., Archibald M. and Harry S. Maddock. By 1873, Thomas had made his way to Trenton and formed a profitable partnership with Millington and Astbury manufacturing earthenware. They produced “toilet sets” – wash basins, pitchers, chamber pots and slop jars, mugs and toothbrush holders – dinnerware, and other household pottery utensils. Thomas Maddock’s primary interest, however, was in finding a way to produce and sell sanitary ware, ie: toilets, in the United States. For most of the nineteenth century indoor plumbing and toilets were a luxury only the wealthy could afford. 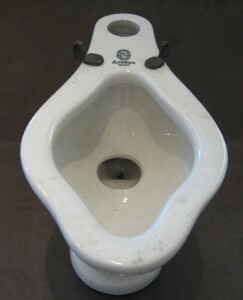 In 1873, there were no manufacturers of sanitary ware in the United States, all toilets coming from England. Thomas Maddock was determined to find a way to produce toilets made of earthenware at a price people could afford. It was not an easy venture. Through trial and error, he had to discover the exact proportion of ingredients to produce both the earthenware and the glaze. He had to figure out a way to stack the unfired pieces in the kiln, stabilize the kiln temperature, determine how hot the kilns should be, how long to fire the clay, and how quickly to cool it down. Other Trenton potters had tried and failed, Maddock’s partners often urged him to give up the endeavor, and even after Maddock had produced a salable product in late 1873, he had difficulty in finding “jobbers” to sell his wares. For the next twenty years as Maddock and others made refinements to the toilet, the sales of sanitary ware grew at a rapid rate. Thomas Maddock and his sons, John, Charles S., Archibald M., and Harry S. took over the pottery firm, renamed it Thomas Maddock and Sons, using 1859, the date of the old Millington and Astbury Company, as their own date of establishment and turned their attention to producing not only toilets (called water closets at the time) but other plumbing fixtures as well. In addition to sanitary ware, Thomas Maddock had interests in other china products. In 1888, he bought the Lamberton Works, renaming it Maddock’s Lamberton Works and there produced high quality domestic and commercial china dinnerware sold to restaurants, railroad companies and hotels all over America. In addition to producing his own lines at the Lamberton works, Maddock decorated the “London” shape dinnerware produced by his cousin’s factory in Staffordshire, England and sold the finished product in this country. In 1923 the Scammell family purchased the company and renamed it. Thomas’ oldest son, John, formed his own company with his sons in 1894 – John Maddock & Sons — producing sanitary ware and other china products. Maddock’s introduction of sanitary ware into the Trenton scene greatly increased the size and the economic strength of the industry. 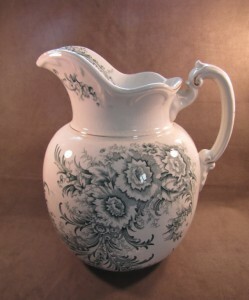 Although china and crockery production continued to be an important element of the Trenton potteries, sanitary ware quickly became the dominant element. Much of the growth that occurred in the industry after 1883 could be attributed to the development of sanitary ware. The value of sanitary ware production equaled or exceeded the output of the china and porcelain manufacturers by the turn of the century. In 1906, the sanitary ware produced amounted to $3.7 million with china and crockery production amounting to less than $2.5 million. The Maddock family companies continued to thrive until the 1920s when, at first labor unrest and a devastating strike and then the rise of the plumbing conglomerates meant that they could no longer compete in the changing marketplace and Thomas Maddock’s Sons were forced to sell to American Radiator and Standard Sanitary Corporation (now American Standard) in September of 1929. 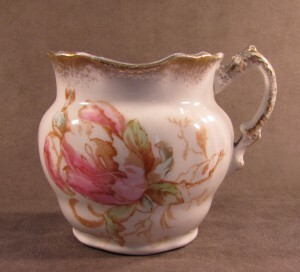 Today, Trenton’s pottery industry is best remembered for its beautifully decorated, high quality artware like the American Belleek produced by Willets, Ott & Brewer and CAC/Lenox. But it was the sanitary ware industry that drove Trenton’s prosperity for fifty years, and for that we must thank the extraordinary vision, innovation, and persistence of Thomas Maddock and his family. For Times article on these potteries and other Trenton industry, click here.